!PENSION: Revolutionary War Pension and Bounty-Land-Warrant Application Files, Natl. Archives microfilm no. M804, roll #168: W-16828. !CITED in "Lieutenant William Barton of Morris County, New Jersey" by William Eleazar Barton, D.D., privately printed, Oak Park IL, 1900, copy in possession of Gary Barton (BART081). !CITED in The Barton Banner, Vol. 1, No. 5 which quotes from Stony Point Illustrated, ed. and pub. by W. R. Kiefer, printed 1888., pp.130-131. 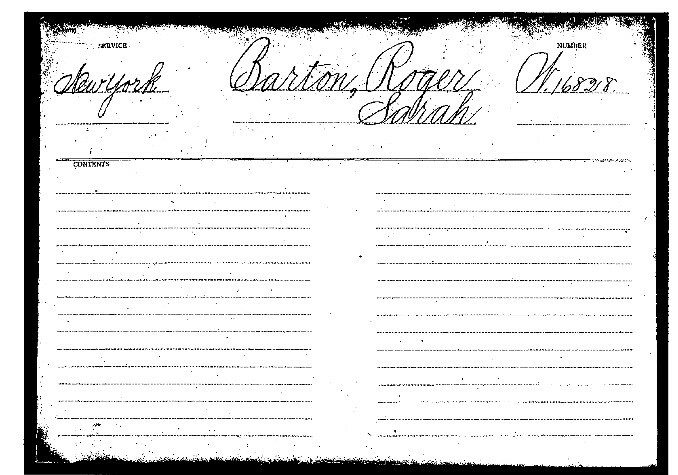 [S3510] Pension Records of Roger & Sarah Barton W16828. [S3903] Revolutionary War Pensions (Footnote now Fold3).